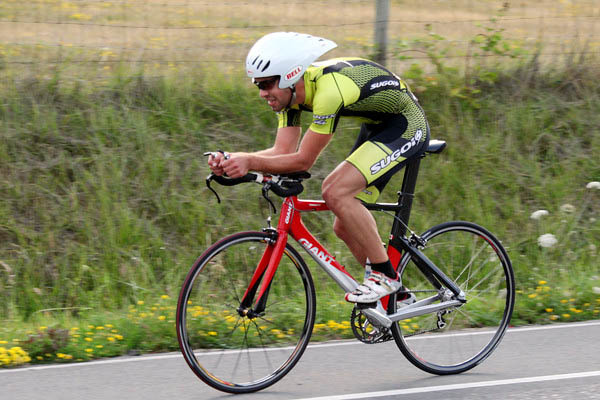 Despite blustery winds throughout the day a total of 47 cyclists showed up in Sidney on Tuesday night ready to race at the final Time Trial of the 2009 season. Most of the local teams were well represented with Tripleshot Cycling, IRC and Schwalbe all with multiple riders raring to go. This was the last chance for riders to score points towards their overall season tally on the fast flatlands of Sidney. Perhaps with that in mind the riders pulled out all the stops and were seen flying around the course looking for those elusive seconds that make the difference between first and tenth. Unfortunately one rider was involved in a crash at a corner which resulted in several riders having to slow down or stop in order to negotiate the turn (after ensuring the downed rider was being attended to). Get better soon Rob! The A race was again won by Craig Richey (Blue Competition Cycles) in a time of 23:22 with Steve Bachop (IRC) taking second in 24:56 just 6 seconds ahead of Aaron Bremner (Schwalbe) in 25:02. 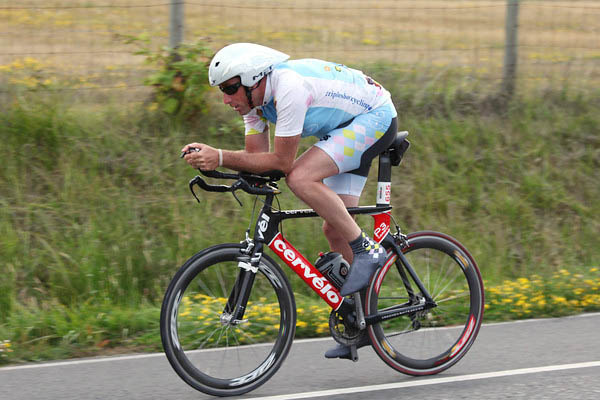 Your intrepid reporter understands that Aaron gives almost all of the credit of his time and place to the borrowed aero helmet he was seen sporting around the course. Good work Aaron! The B race saw Peter Lawless (Tripleshot Cycling) take his third win in a row with a time of 25:08. Second was earned by Duane Martindale (IRC) in 25:35. Roland Rabien (Tripleshot Cycling) edged onto the B podium in a time of 26:14 leaving Casey Rider (Schwalbe) in 4th just 1 second back. In the Women's race Lysanne Lavigne (Unattached) came out the winner in a time of 27:26 with Jennifer Erlendson (OrganicAthlete) taking second in 31:02. A final note should go out expressing all of the riders' thanks to Sidney Velo and the fantastic volunteers who came out week after week in order to let us race. Chapeau! Next up for the League is the Mt. Doug Hill Climb on September 12th.